In addition, web sites of large builders (those with at least 25 starts) also usually provide downloadable brochures and virtual tours, and to advertise the benefits of buying a new home. It turns out that larger builders generate a larger share of their business from their web sites—35 percent, compared to only 10 or 12 percent for remodelers or smaller single-family builders. Could smaller builders get more customers from their web sites by expanding what’s offered on the sites? Looking at the smaller builders in more detail, the answer appears to be yes. Builders with fewer than 25 starts, who provide neither downloadable brochures nor material on the benefits of buying a new home on their web sites, get only 7 percent of their potential buyers from the site. But the share rises to 27 percent for small builders who provide both downloadable brochures and material on the benefit of buying a new home. 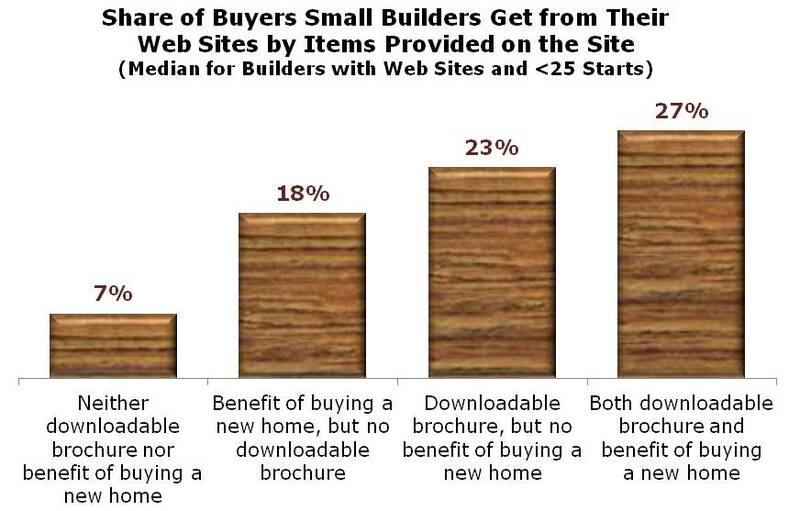 So it really seems that many small builders could significantly increase the share of business they get from their web sites by providing: 1) downloadable brochures, and 2) information on the value of buying new homes on their sites. Material from NAHB on the benefits of buying a new home includes the piece on lower operating costs for new homes and the various consumer flyers and guides in the New Homes Month Toolkit, which will be updated and expanded in conjunction with the next New Homes Month, which occurs in April. Among remodelers, the results are not quite as dramatic, but still significant. Remodelers who provide downloadable brochures generate twice as many customers from their sites—18 percent—compared to 9 percent for those who don’t. Further discussion and more detail are contained in the March 2012 Special Study in HousingEconomics.com.